This website highlights the collaborative research of Eugenio (Gino) Nearns on the systematics of cerambycid beetles. Gino is a National Specialist (Coleoptera) with APHIS/PPQ's National Identification Services (NIS). The longhorned wood boring beetles (Insecta: Coleoptera: Cerambycidae) are a diverse and economically important group of insects. With an estimated 4,000 genera and 35,000 described species, the Cerambycidae comprise one of the largest beetle families (Lawrence 1991). Cerambycid beetles are found on all continents except Antarctica, from sea level to montane sites as high as 4000 m (Monné & Bezark 2011). Nearly all are phytophagous or xylophagous as larvae, feeding within living, moribund, or decaying wood. Cerambycids are among the most serious wood boring pest species globally, affecting many agricultural crops, ornamental trees, and lumber products, and causing millions of dollars in damage each year (Solomon 1995). One of the most notorious cerambycids is the Asian Longhorned Beetle (Anoplophora glabripennis, or ALB). In 1996, this invasive species was discovered in New York City and later in Chicago. Native to China and the Korean peninsula, ALB was accidentally imported into the U.S. via wooden shipping materials (Lingafelter & Hoebeke 2002). By 1998, ALB infestations resulted in the destruction of nearly 7,000 trees. Recently, the USDA estimated that, if left uncontrolled, ALB and other Chinese wood boring beetles could cause more than $100 billion in damage to the US economy (Meyer 2010). Accidental introductions continue, and as recently as 2011 a population of ALB was detected in southwest Ohio (USDA-APHIS 2011). The family Cerambycidae is a charismatic group that has been popular with insect collectors for centuries. Cerambycid beetles exhibit a remarkable diversity of biology and morphology, and range in size from a few mm to over 17 cm. 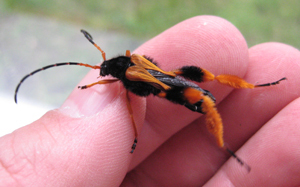 Many species are nocturnal and cryptically colored; others are diurnal and exhibit spectacular mimicry of hymenopteran forms (e.g., bees, wasps, and ants) and behavior. Cerambycid beetles have been associated with a wide variety of plant hosts, including grasses, bamboo, conifers, hardwoods, and cacti. In addition, cerambycid beetle larvae are known to utilize nearly all parts of a host tree, including the roots, trunk, branches, leaves, and seeds. Despite their economic importance and biological diversity, relatively little is known of cerambycid beetle ecology, behavior, or phylogenetic relationships. A better understanding of all of these factors would greatly contribute to conservation of endangered species, and in managing invasive species that could become pests in their new countries and habitats.